Pre-event paste supports focus, oxygenation, energy, and stamina for "best day" performance for horses. Perfect pre-event paste for "best day" performance. Helps to boost energy, stamina and oxygenation; cartilage and capillary health; joint lubrication and calm, focused demeanor. Time tested winner. "…extra edge needed to compete." Performance Paste is the perfect pre-event paste for "best day" performance. Maintains healthy energy, stamina and oxygenation; cartilage and capillary health; joint lubrication and calm, focused demeanor. It's a time-tested winner. Recommended for supporting performance and normal muscle recovery. Pre-event: Give one tube six to eight hours before event. Optional:Give one tube the evening before and one tube 6 to 8 hours before event. For animal use only. Keep out of reach of children and animals. In case of accidental overdose, contact a health professional immediately. This product should not be given to animals intended for human consumption. Inactive Ingredients:Alcohol (15% as a preservative), Fructose, Purified Water, and Vegetable Gum. Safe use in pregnant animals or animals intended for breeding has not been proven. If animal's condition worsens or does not improve, stop product administration and consult your veterinarian. Administer during or after the animal has eaten to reduce incidence of gastro-intestinal upset. Federal law prohibits the off-label use of this product in ruminants. An examination from a veterinarian is recommended prior to using this product. Use with caution with cardiac glycosides and MAO inhibitors. Should be used with caution in those animal with hypertension. May be hypoglycemic. Leila Ann - 2017-2018 Alabama Junior Rodeo Queen! I just want to say thank you for being a company of your word. My daughter, Leila Ann, competes in Alabama Junior Rodeo in Barrels, Poles, Goat Tying, and Breakaway Roping. 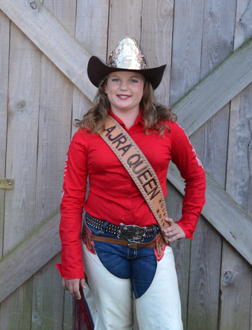 Leila is the current Alabama Junior Rodeo Queen. Her horsemanship pattern and score was the highest of all of the young cowgirls competing for Rodeo Queen. I give much credit to your Performance Paste as it did a wonderful job of helping Leila's mare maintain her calm and concentration. We also use the Performance Paste on our other barrel horses. It gives them the extra edge needed to compete. We love your products! 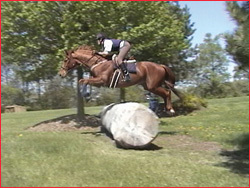 Sarah and Roswell clearing a jump with room to spare. "We put down the dressage test of a lifetime." Nervous Horse – "…it really works!" Dear Springtime, My daughter uses Performance Paste for her horse. I ordered some and had it on hand. It's much easier for her to use because it does not have to be given daily. I bought it thinking it would be something natural that we could use before horse shows to calm her down a bit. My daughter did not think it worked until she stopped using it. When she used it, she was placing in every event, but as soon as she stopped, her horse was more nervous and did not do as well. She was no longer winning. This went on for a while and she was becoming very frustrated. 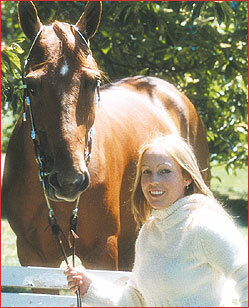 As soon as she began using Performance Paste again, her horse began winning. You made a firm believer out of her! She did so well, she was one of two people in her age group selected to go to State show based upon her riding. Her equestrian team now gets to go on to represent our district in the Michigan Interscholastic Horsemanship Association! What a fine product you've made. We both can say it really works!